Just a small update today but still an important one. Took a quick trip from Monroe to Pageland. 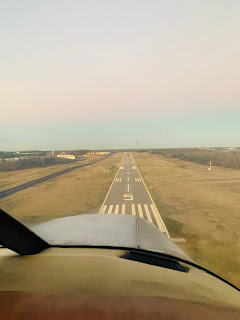 What makes this important is Pageland is a much smaller runway and airport than Monroe. Still plenty of room for the little Cherokee, but still got to perform a short field departure. Most importantly today was the first day we reached out to CLT approach to verify the xponder. I was able to talk to CLT approach and not only did they immediately pick me up with no issue but the altitude was reading perfectly. Finally today was my first flight with my 'new to me' iFly 700 as a backup to my iPad. It's a nice unit and I really enjoyed having it in instrument mode so I could get the heading indicator in a heads up view. It was really handy to have and easy to read in the full sun. Here is the video if you would like to see how she handles on a much shorter runway. Please note how it leaps off the ground on that short field. Just read every entry. Great story! I'm curious if you've reached out to the previous owner since you've got the plane airworthyou again to let him know. I'm sure he'd love to hear it!